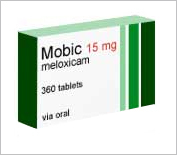 Meloxicam is a non-steroidal anti-inflammatory drug (NSAID) that is used in the treatment of pain and swelling in the joints generally caused by arthritis, osteoarthritis, juvenile rheumatoid arthritis. It is sometimes sold under the brand name Mobic by the drug company Boehringer-Ingelheim and works to calm inflammation in the joints and the lining of the joints. It is also responsible for helping regulate the body’s pain receptors, reducing discomfort significantly. It is also used to relieve tenderness, swelling and stiffness in the joints. It may also be used to treat juvenile rheumatoid arthritis, a type of illness that can be found in children under the age of 2. Its primary function is to stop the body’s production of a sensation known as pain. It also fights fever, inflammation, and other external symptoms of illness. Meloxicam comes in both tablet form and liquid form. It can be consumed once daily with or without food. It is important that the patient adhere to habitual oral use of Meloxicam. For example, the patient should consume the drug at the same time every day and not stray from that pattern. You should follow the directions precisely and ask your doctor or pharmacist if you have any questions regarding the instructions on the bottle. Be sure to shake the bottle if the Meloxicam you have been prescribed is in suspension (liquid) form. Meloxicam works by inhibiting a process known as inflammation; inflammation is a way of allowing the body to protect and heal itself, and can be very useful as a reaction to injury or infection. The affected area receives an increased blood flow, and various chemicals are released. The blood flow causes the area to become swollen, hot and red. The chemicals cause pain, which results in reduced movement of the area, giving it time to rest. When it is healed, these symptoms go away. However, when this process of inflammation occurs in a condition like rheumatoid arthritis, it is far from useful. Instead of being a temporary healing reaction to a problem, it becomes a long-term situation in an otherwise healthy area of the body. The joints become swollen, red, painful and hot, with limited function for a long time. The symptoms can recur, and also affect other joints of the body. Meloxicam and the other NSAIDs block the action of an enzyme called COX, which produces prostaglandins, important chemicals involved in inflammation. By blocking the production of these prostaglandins, the process of inflammation is disrupted. This reduces the amount and intensity of the symptoms, providing pain relief, and a reduction in joint pain and stiffness. However, meloxicam relieves inflammation for only a few hours after it is take. This provides only a temporary relief from the symptoms, and it does not affect the course of the disease. To manage these diseases long-term, joint replacement surgery is usually required for osteoarthritis, and a group of drugs called DMARDs for rheumatoid arthritis. If you have ever had an allergic reaction to any other medication in the NSAID group of drugs (e.g. ibuprofen, diclofenac, indomethacin, naproxen) you should not take meloxicam. If you have been started on meloxicam and you have had an allergic reaction to an NSAID and you doctor does not know this, stop taking meloxicam and arrange to see your physician. This is because these conditions can affect the dosage of meloxicam that you should be given. In addition, you should tell your doctor if you are about to take meloxicam and are pregnant, planning to become pregnant or breast feeding, because this will affect your treatment.